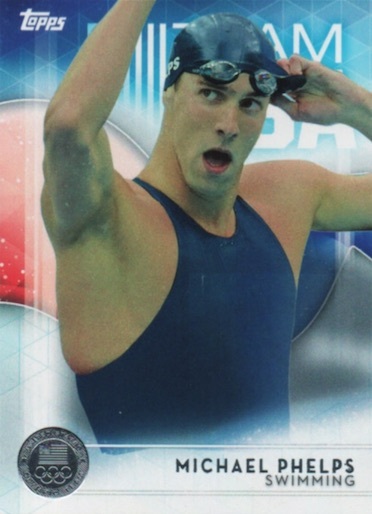 Capturing the glory and pageantry of the 2016 Summer Olympic Games in Rio, 2016 Topps US Olympic and Paralympic Team Hopefuls concentrates on the top athletes for the United States heading into the games. Each hobby box includes two relics and one autograph. The 100-card base set includes the biggest stars across multiple sports that are expected to have a spot in Brazil. Adding to that, medal-themed parallels include Bronze (1 per pack), Silver (1:2 packs), Gold (1:3 packs) and Gold Rainbow (#1/1). Featuring up to 40 key names, the Base Autographs offer a premium hit option and are joined by numbered Bronze, Silver, Gold and Gold Rainbow (#1/1) parallels. 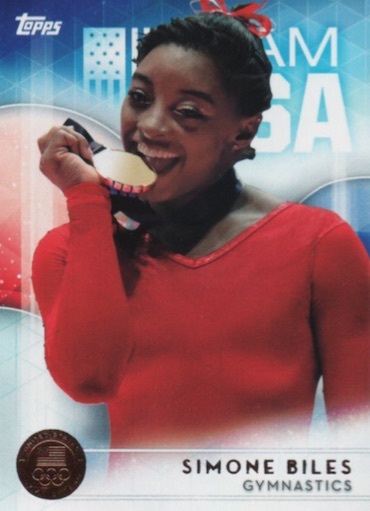 Much more limited, U.S. Olympic Champion Autographs celebrate ten of the biggest former champions with a hobby-exclusive insert. 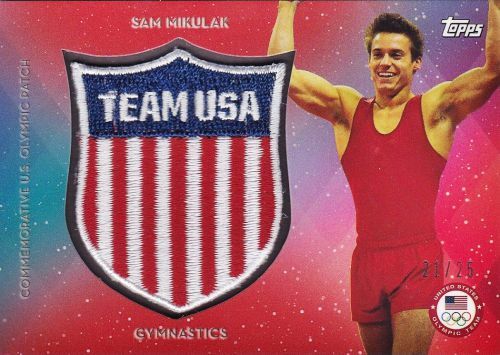 Among the other signed options, hobby-only U.S. Olympic Cut Signatures highlight legends with one-of-one cards and Autographed Relics offer cards that feature a signature and athlete-worn relic for up to 20 top subjects. Red, Gold and Gold Rainbow (1/1) parallels present more rarity. 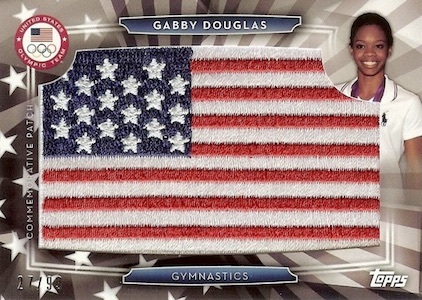 Rounding out the main hits, U.S. Olympic Team Relics feature up to 50 athletes with memorabilia swatches. Again, Bronze, Silver, Gold and Gold Rainbow (#1/1) parallels are in play. 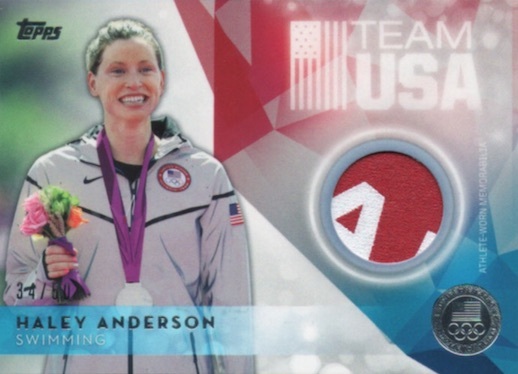 Beyond the standard hits, a variety of commemorative relics can be found in 2016 Topps US Olympic and Paralympic Team Hopefuls. 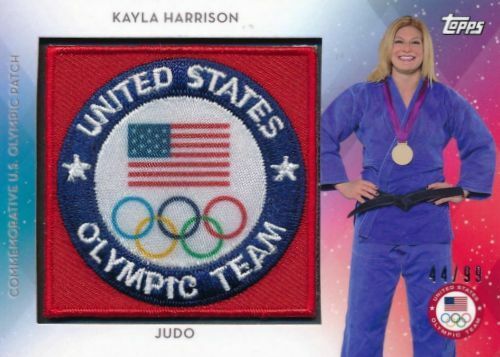 Each including up 25 to subjects, United States Olympic Team Patch, American Flag Patch and Team Crest Patches give collectors a trio of choices with manufactured patches. In addition to base versions, there are also numbered Gold and Red parallels. One last relic comes in the form of Commemorative Olympic Medals. 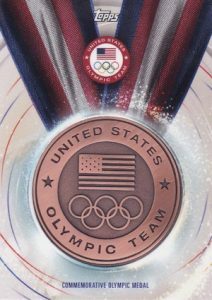 Honoring the iconic medals earned by the greats of their craft, versions include Bronze, Silver and Gold, with each found as Blue or Red parallels. Finally, several inserts give more options to set collectors. Olympic Disciplines (1:4 packs) document an athlete, their event and the rules behind that event. 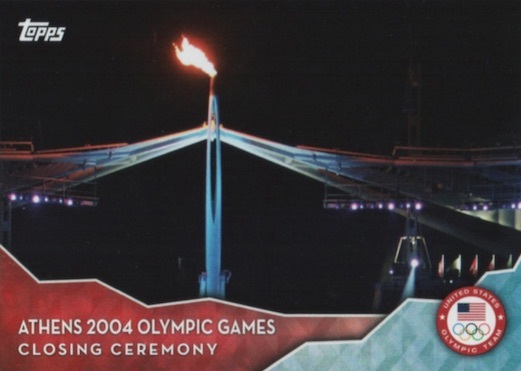 Memorable Moments (1:8 packs) look back at key events, and Closing Ceremonies (1:24 packs) offer a retrospective on past games, including medal counts. 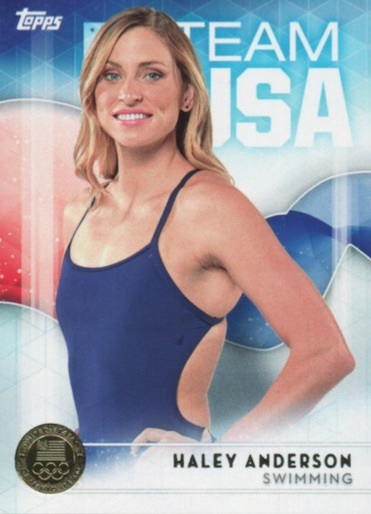 2016 Topps Olympic #11 Melissa Stockwell Bronze Auto!!! 07 50!!! 2016 Topps Olympic #25 Jake Dalton Bronze Auto!!! 44 50!!! 2016 Topps Olympic #14 Missy Franklin Silver Auto!!! 11 30!!! 74 cards. No card #37 included in final checklist. Shop for complete base sets on eBay. PARALLEL CARDS: Bronze - 1 per pack, Silver - 1:2 packs, Gold - 1:3 packs, Gold Rainbow 1/1. PARALLEL CARDS: Bronze #/50, Silver #/30, Gold #/15, Gold Rainbow 1/1. PARALLEL CARDS: Bronze #/25, Silver #/5, Gold #’d, Gold Rainbow 1/1. PARALLEL CARDS: Silver #/50, Red #/25, Gold #/5, Gold Rainbow 1/1. 6 cards. Serial Numbered 1/1. Hobby Exclusive. PARALLEL CARDS: Bronze #/75, Silver #/50, Gold #/25, Gold Rainbow 1/1. PARALLEL CARDS: Red #/25, Gold #’d. Good: Price point is reasonable, most boxes have extra hits. Bad: Very generic feel, too many commemorative relics, uneven checklist. 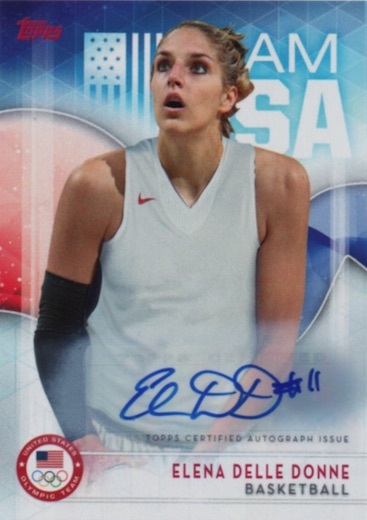 The Bottom Line: As the sole Olympic product for the Rio games, 2016 Topps US Olympic and Paralympic Team Hopefuls (doesn’t quite roll off the tongue) gives collectors something to chase, and this is a good thing. However, the product is really bland and even extra hits make it a tough proposition. So, the entirety of the box is base or base parallels, two different inserts and then the hits. The base set design takes close-up images of most athletes, many of which are airbrushed to just a plain, one-color top or outfit, and adds a large Team USA logo in the corner. The small bio on the back is a nice refresher, especially for the athletes I was not as familiar with. I guess the appeal in my mind for this set is the mix of sports and I would think this would be a great opportunity to showcase athletes in action shots from their chosen fields. Instead, we get a lot of seemingly-posed photos that get boring in a hurry. The parallels are fairly subtle but I actually like the simplicity of the medal-themed foil differences (Bronze, Silver & Gold) and they are still easy to spot, in my opinion. Then there are the two basic inserts. On the design front, Closing Ceremony is fine. Not remarkable, but a nice break from the base. The red and blue frame at the bottom is a little obnoxious but it is still interesting to see the earlier games. 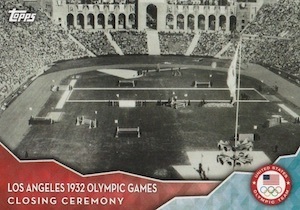 Olympic Disciplines is the other insert and somehow these are even more plain than the base with a horizontal layout that ends up with the card being over 1/3 diagonal frame. 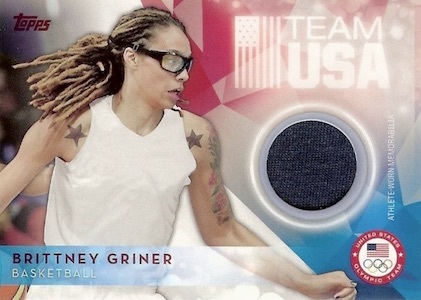 The rest of 2016 Topps US Olympic and Paralympic Team Hopefuls is the “hit” cards. In addition to sticker autographs and penny-sized jersey relics, there are four different commemorative relics. As previously stated, the Olympics are exciting because of all the different things thrown together. However, when you see this checklist, the games seem much more narrow in scope. The athletes included are heavy on swimming and women’s basketball with much more limited coverage for the remaining sports. Arguably the most popular team at the entire Olympics would be US men’s basketball team but they are nowhere to be found. I realize that this deals with licensing (Panini owns rights to men’s USA Basketball) but it is just a crazy concept to understand. Track & Field is also woefully underserved. When it comes to signers, the window shrinks even more. The autograph checklist is heavily centered on women’s basketball and swimming with nearly half consisting of just those two sports. 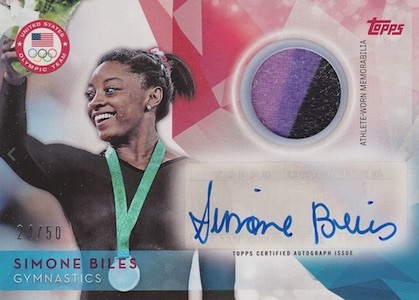 On the other hand, it may end up being huge that Topps managed to get Simone Biles (gymnast) to sign, so that could help a lot going forward if she produces as expected. 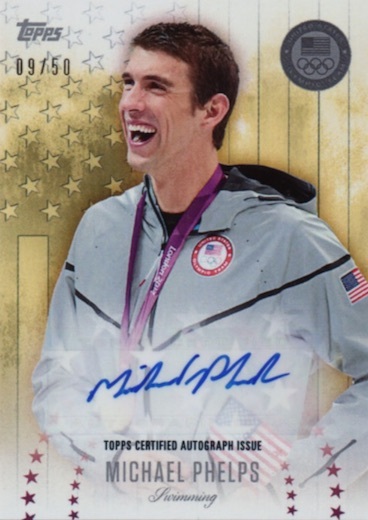 Although he already signed a good amount in previous products, Phelps is another big signer. Like many sets, the only aspect that has consistent value is the autographs. Because the focus is on current athletes — even the Champions insert — that definitely limits the value potential as previous sets had multiple former greats included. Having said that, there are some stronger current names in play, including Michael Phelps and Simone Biles. It is no mistake that many of the boxes under-promise and over-deliver the guaranteed hits and this does help value if you end up pulling an extra autograph (like my box did) instead of just an extra relic. The box I opened included five total hits. That is the definition of added value. I have not seen a ton of other breaks, but some boxes have as many as six hits, including three autographs, and I don't recall seeing one that had less than four hits. Based on this, the value does increase but you are essentially banking on that trend continuing throughout the run. If every box had just the one autograph and two relics, the value would dip greatly. Pulling extra hits is fun. Getting two notable autographs from a weaker list of signers is very fun. Despite this isolated instance, I can’t honestly say the enjoyment would have been the same had I gotten the advertised hits or less-desirable autographs. To me, most of the cards aren't very visually appealing, the checklist is inconsistent and the overall coverage is disappointing. No number of extra hits can change that. 2016 Topps Olympic Missy Franklin Relic Auto!!! 41 50!!! Wish the gold parallels were more limited and the silver a box hit. And wish they had a more limited basic insert program. An insert as a case hit and one that was either 1:3-1:6 boxes would be nice. UD killed it with reviving the limited inserts with Fleer Retro and I wish Topps and PaniniAmerica would follow suit. A Gold Label insert would be perfect for this set. Bought a ton of the 2012 product and did pretty well with it and enjoyed it. I hope topps follows the same format with retro autos, but avoids retro autos of the class of 2012. New autos such as Kaytlyn Jenner might seem queer to some, but I want one, Ali and Larry Holms autos, I would fight for. Past Olympic memorabilla would or could be a cut above. USA loves the Olympics, and for every pack bought, a donation could go for support of the sport. I would pay the extra, for the extra mile or wrapper, and a medal of support would be cool. This product has the chance, to enhance the greatest event in the world of sports, and at a crucial time in the history of the sport. I hope it can raise the bar, go the miles, and support the weight. It did four years ago, go Topps. What a disappointment this is! What’s up with the checklist? No Katie Ledecky, no Kerri Walsh, no Alex Morgan or Hope Solo. Are you friggin kidding me picking others over them?! Rulon Gardner?? Seriously?? Here’s an idea…feature actual CURRENT athletes who might actually win in Rio and that we haven’t seen cards of 100x already! The 2012 set was great, this is straight garbage. Was gonna pre-order a case, thank God I didn’t! Fail!! I agree with CW on this product, the 2012 Topps Olympic Cards were classic and had that vintage classic look like the Allen & Ginter. 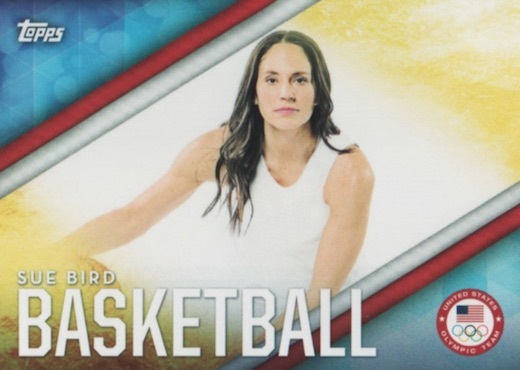 This product is horrible with athletes I’ve never heard of and not to sound sexist but all the relic and autos are of female athletes that serious high end collectors like myself will not even bother with. This product has completely failed the high end collector and the Olympic enthusiasts but it doesn’t surprise me Topps is losing most of there sports licenses with all the majors so leave it up to them to screw this product up on there Sophomore run. Don’t bother buying this product it’s a waste of money and a loss on the collection end. I also, was looking forward to buying a few cases but it looks I’ll get lucky with Panini Football. Such an extremely limited checklist and is hardly representative of the US Olympic team. No sailing, no rowing, only 3 Para-Olympians? Talk about falling flat. I’m not sure what is going to be a biggest disaster – this product, or the actual games themselves. While I agree that the checklist is very limited (I would’ve liked more track athletes like in 2012), and the hits seem to be primarily female athletes (but that is what we’ve been most dominant in lately), I still gave it a 4 because I got super lucky and got a “hot box”. 2 regular autos (1 was silver /30), 1 relic auto /25, 1 flag patch /99, and 1 regular relic. So for the $67 I spent I’m pretty happy. Still working on master sets of 2012 and 2014, along comes 2016. Only 75 cards in the base set. Why? 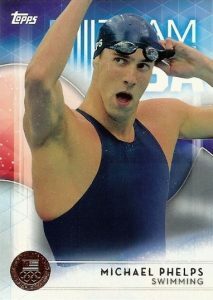 One of the great things about Olympic sets is collecting new athletes instead of the same old same old. Would like a much larger base set. A lot more short printed inserts in this set, a master set will be much tougher than in 2012 and 2014. 2016 Topps US Olympics Factory Sealed 16 Box Blaster CASE-Look for Phelps AUTO!